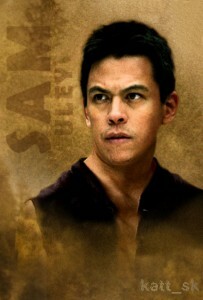 Personal history: Personal history: Sam Uley was the son of Josh Uley and the grandson of Levi Uley. Because of his Quileute heritage, he had the potential to become a werewolf and he was the first of the current generation to transform, because the Cullen vampire clan returned to live nearby in Forks, Washington. Sam was possibly one of the teenagers from the reservation that came to socialize with Mike Newton and his friends. He may have been the person to mention that the Cullens were unwelcome on Quileute land. (TW6 p. 121) Prior to his transformation, Sam was dating Leah Clearwater (EC4 p. 117) and was in line to receive a college scholarship (NM7). Sam imprinted on Leah’s cousin Emily Young. He accidentally scars Emily during an uncontrolled transformation and ironically, it is this tragedy that brings them together as a couple. (NM15) Sam regrets hurting Leah but cannot help but adore Emily. When Leah also became a werewolf, it caused tension in the pack because of Sam’s guilt over Leah and Leah’s continued love for Sam – for Sam, Leah was “the pathetic ex-girlfriend he can’t get away from” (BD12 p. 230). Sam continues to feel uncomfortable about “the Cullen situation”. When Jacob decides to attend Bella’s wedding, Sam stays nearby to ensure Jacob is safe and nothing bad happens. Jacob learns that Bella plans on being intimate with Edward during their honeymoon and Sam intervenes before Jacob can phase and attack Edward. (BD4 p. 67) Sam respects the treaty between the Cullens and the Quileute pack, but is ready to attack if the situation calls for it. (BD8 p. 150, 161) Sam decides that Bella’s sickness and potential transformation does not warrant intervention, but when he learns that Bella is having a vampire-sired baby, he chooses to plan an attack. (BD10 p. 201) Sam worried about his pack’s survival and decided that he would fight Edward himself because he felt Edward would be the biggest threat. (BD10 p. 204) Jacob breaks away from the pack because his lineage meant that he was the true Alpha of the pack; Sam tried to use his alpha male powers to force Jacob to obey (BD11 p 209) but the attempt failed. Jacob, Seth and Leah become a new pack and Sam sends a group to discuss things with the new pack. Sam does not want a “family brawl” (BD13 p. 263) but with two alphas, the packs cannot merge into one. When Renesmeee is born and Jacob imprints on her, Jacob goes to meet with Sam and explain the situation. Sam and Jacob renew the treaty with Carlisle. (BD23 p. 457) Sam and his pack continue to monitor their lands and Sam is the one to see Alice leaving across the ocean (B 29 p. 557). When the Volturi come to convict the Cullens of vampire crimes, Sam’s pack and Jacob’s pack (together now numbering sixteen members) come to defend Renesmee and her family. When Aro muses about werewolf guard dogs, it is only Sam’s command that halts the ferocious growls of objection. (BD36 p 700) Aro explains that Sam and the others are not true werewolves/Children of the Moon, but actually shape shifters, because shape shifters are genetically created and can come out during the day. (BD37 p 705).